The United States runs on fossil fuels: the millions of cars streaming along our highways burn gasoline; the lights shining in windows and frigid air wafting out of opened doors are fueled by electricity produced in fossil fuel burning power plants; and we keep the chill out of our homes by burning oil and gas. As concern over global climate change increases and our supplies of fossil fuels dwindles, scientists turn to alternative sources of energy. 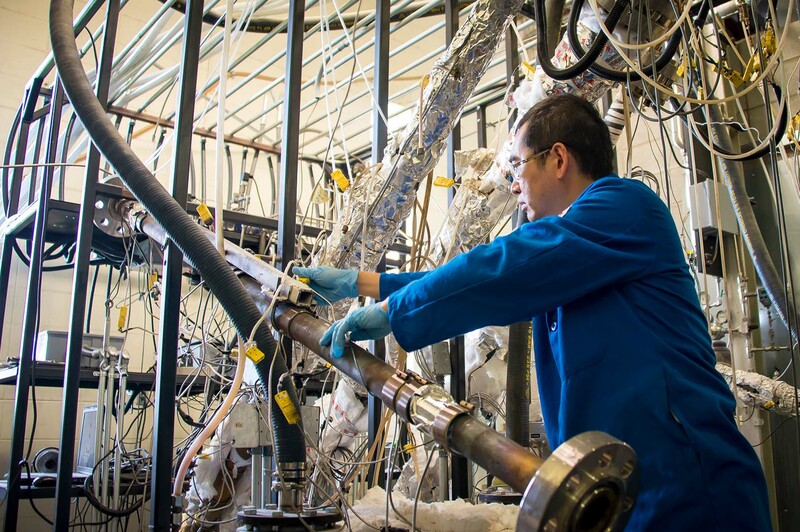 Dr. Fei Yu, MAFES scientist and research professor in the Department of Agricultural and Biological Engineering, is researching one of the most promising technologies for a fossil fuel replacement: biomass-to-liquid fuels, or BTL. “BTL is our best chance at producing biofuels from renewable resources on a large enough scale to mitigate global climate change,” Yu stated. 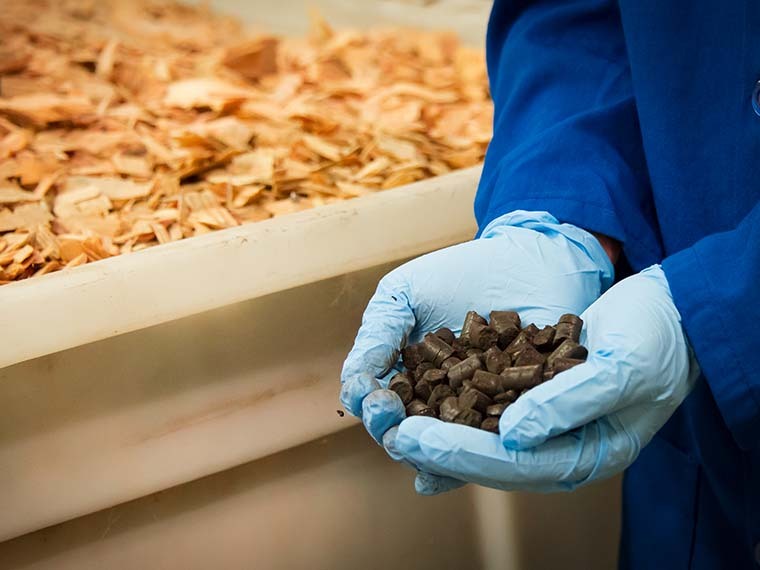 The technology uses biomass, such as woodchips or switchgrass, to generate liquid fuel that acts as an alternative to fossil fuels. Because woodchips and switchgrass are plant-based, they are quickly renewable—unlike fossil fuels, which require millions of years to form. One of the main breakthroughs of the project was developing a one-step conversion process that transforms the biomass into syngas—a fuel gas mixture that consists of hydrogen, carbon monoxide, and carbon dioxide—which then can be converted into a number of different fuel types. “We utilize biochar, a charcoal generated from plant matter, as a catalyst. Then, depending on the product we are looking for, we can add different transition metals, and promoters, which keep everything stable. With that we turn biomass into syngas, which can then be converted into liquid fuel,” Yu explained. This technology is especially exciting because of its versatility; it allows for the researchers to take the same biomass and turn it into different types of fuel depending on which transition metals they use. Prior, the methodology required multiple steps before the pure syngas could be turned into different fuel types. On Mississippi State’s campus, researchers developed two different models of the converter: a lab scale one, which allowed them to initially test the process, and also a pilot scale converter. Building the pilot scale converter allowed them to demonstrate that the technology could be utilized on a commercial scale. And in the name of commercialization, the researchers recently patented the technology, and licensed the patent to a local industry leader, Choctaw Coal & Energy Co. However, while this technology makes great strides in reducing our dependence on fossil fuels, it may also provide more sustainable ways to utilize the raw material reserves in our country. “Choctaw Coal & Energy Co. has interest in developing sustainable diesel products. However, the main deviation from our research is that they want to start not only from renewable products, but also from lignite coal,” Yu explained. Lignite coal is a low quality coal that is plentiful throughout Mississippi and Alabama. With its low carbon content—roughly 40 percent—it is similar in climatic impact to biomass feedstock. There also is a coal mine only twenty miles from Starkville in Ackerman, Mississippi—which would make lignite far cheaper to transport than biomass imported from around the country. “We started conducting research to see whether the lignite could be used with our catalyst, and we quickly found that it works similarly. We convert it into syngas, which can then be turned into liquid fuel,” Yu stated. 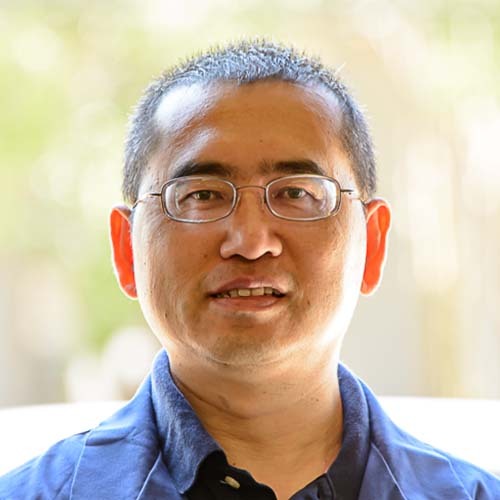 Dr. Yongwu Lu, Yu’s former graduate student and postdoctoral associate in the Department of Agricultural and Biological Engineering, spoke to the importance of this technology. “Biomass to liquid fuel technology is one of the most exciting technologies to produce useful and high-value biofuels. If this technology is utilized commercially, we may be able to help mitigate global climate change, minimize use of fossil fuels, and prevent carbon dioxide production,” Lu said. He also spoke to Dr. Yu’s stellar work in the field. Passion At Work: I strive to provide sustainable energy solutions for the current energy consumption network and answer biofuel processing questions by fundamental scientific experiment and design.